The reduction of venous thromboembolism (VTE) via VTE prophylaxis practice improvement is a major health care goal for national quality initiatives, such as those of the Joint Commission. We assessed the rate of appropriate VTE prophylaxis, according to the 7th ACCP guidelines. We previously reported the rates in surgical patients (ASH annual meeting 2007), and in this analysis we compared these with the rates in medical patients. Patient discharge records from Premier's Perspective™ inpatient database (January 2005‐December 2006) were reviewed to compare the rates of any and appropriate VTE prophylaxis between medical and surgical discharges at risk of VTE. Discharged patients age 40 years and older identified as being at risk of VTE by the 7th ACCP guidelines and without contraindications for anticoagulation were included. A high‐risk VTE population was selected by requiring each discharge to have a minimum length of stay of 6 days. Appropriate VTE prophylaxis was defined as meeting guideline recommendations for prophylaxis type (pharmacological or mechanical), dosage, and duration. A total of 390,024 discharges met the inclusion criteria; 201,224 medical discharges (51.6%) and 188,800 surgical discharges (48.4%). Although 71.6% of patients received at least 1 order for VTE prophylaxis during their hospital stay, only 14.5% received appropriate prophylaxis, defined as the guideline‐recommended daily prophylaxis type, dose, and duration. 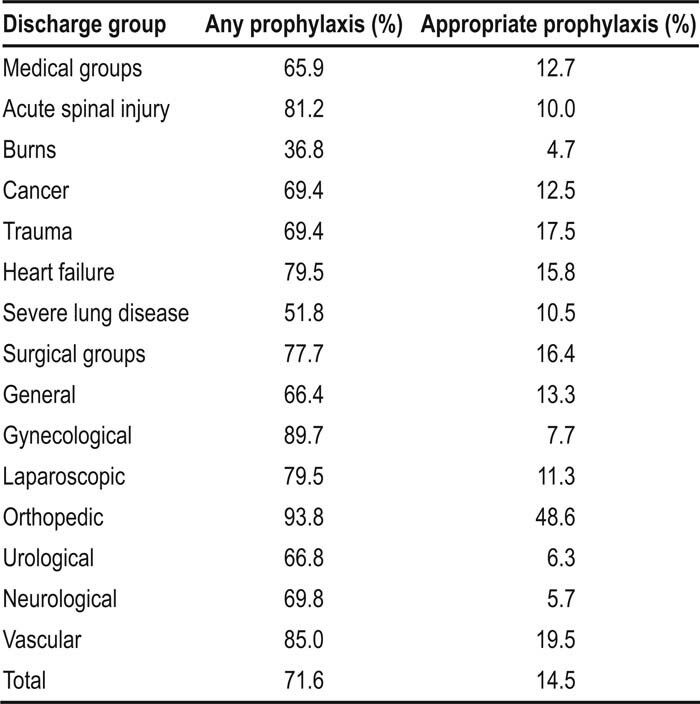 Surgical discharges received a higher rate of any prophylaxis (77.7%) and appropriate prophylaxis (16.4%) than did medical discharges (65.9% and 12.7%, respectively , with variation observed between different diagnosis groups (Table 1). When comparing the reasons for not receiving appropriate prophylaxis, differences were found between medical and surgical groups. For the medical group, 34.1% of all discharges did not receive any prophylaxis, despite having no contraindications to anticoagulation. In the surgical group, 36.1% of all discharges received prophylaxis for an insufficient duration. Approximately 6 of every 7 hospitalized U.S. patients at risk of VTE do not receive appropriate prophylaxis. Although the rate of appropriate prophylaxis is higher in surgical patients than medical patients, significant improvement is required in both groups. Quality initiatives will be important in improving hospital prophylaxis. We anticipate the role of hospital‐based physicians being crucial in improving rates of evidence‐based VTE prophylaxis in medical and surgical patients. A. Amin, University of California‐Irvine, Consultancy/honoraria from sanofi‐aventis; J. Lin, Sanofi‐aventis, Employee of sanofi‐aventis; S. Stemkowski, Premier Inc, Research funding from sanofi‐aventis; G. Yang, Premier Inc, Reserach Funding from sanofi‐aventis. Amin A, Lin J, Yang G, Stemkowski S. Rates of Guideline‐Recommended Venous Thromboembolism Prophylaxis in U.S. Hospital Patients. Abstract published at Hospital Medicine 2008, April 3-5, San Diego, Calif. Abstract 4. Journal of Hospital Medicine. 2008; 3 (suppl 1). https://www.shmabstracts.com/abstract/rates-of-guidelinerecommended-venous-thromboembolism-prophylaxis-in-u-s-hospital-patients/. Accessed April 26, 2019.